Most to-do lists nowadays provide the capacity to attach a note to a task. These notes can vary from a couple of lines to extensive web clippings or file attachments. The gold standard these days seems to be whether the productivity app provides integration with evernote. I will look briefly at four that do: omnifocus, nirvana, nozbe and zendone – although ‘integration’ seems to mean something quite different in each case. A word of warning: this is a rather dry, technical post and if you would rather bail out now I am happy to direct you to a very funny post by a fellow blogger who recently shared his anxieties about niches, target audiences, flagging readership and the like. I can relate to that – my WordPress country stats show me I am yet to make headway into South America, China, Africa and Iceland. Most places, actually. Where are you folks? In omnifocus, integration with evernote means that you can copy the ‘note link’ in evernote (by right-clicking on the note) and paste it in the ‘note’ section of the omnifocus task (see screenshot). Clicking on the link takes you to the note in evernote. 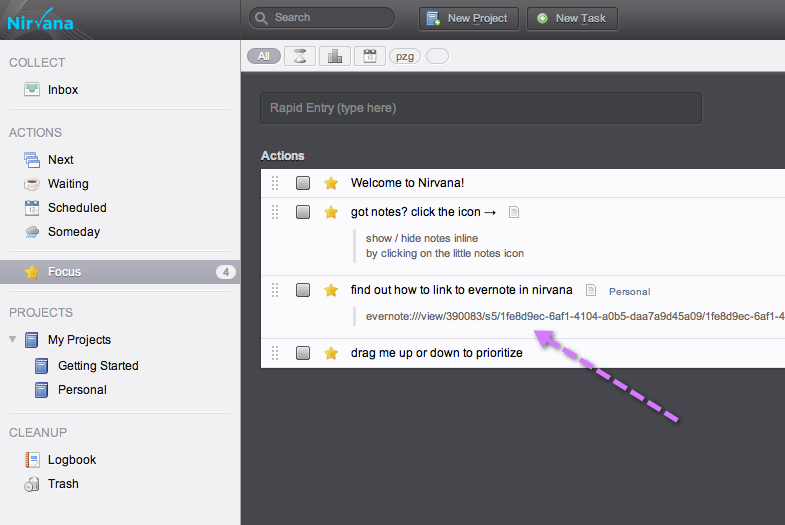 Like omnifocus, nirvana provides a hyperlink to the task in evernote. Nozbe, which is about to launch its desktop apps for windows and mac in a couple of days, takes a different approach. You first authorise nozbe to access your evernote account. If an evernote tag has the same name as a nozbe project, then all notes with that tag will be imported into nozbe and shown in the folder associated with the project. You can view, but not edit these notes. It all works perfectly – the only hitch is that you risk capturing more information than you really need if your evernote tags are too broad, but that is a user issue and something you can tweak. The screenshot below shows the browser version; the new desktop app looks more elegant and has discrete tabs for tasks, notes and files for each project. I have a review of the nozbe desktop version ready for when the app goes live, so keep checking back for more detail. 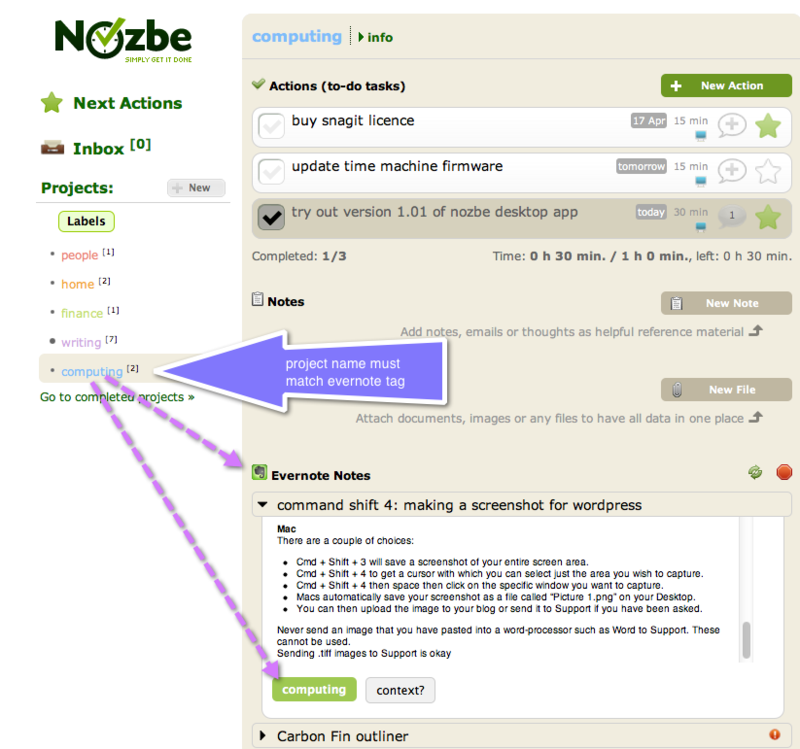 Integrating evernote with the yet to-be-overhauled nozbe browser version. The new desktop app looks much prettier. Zendone takes integration with evernote further still. You first authorise the app to access your evernote account and then create an @inbox folder in evernote, which you link to zendone (this is mostly done via the zendone preferences pane and takes less than two minutes). You can now use your evernote inbox to collect all sorts of notes (photos, addresses, tasks, notes) as you go and use the zendone inbox to organise that material when you have a moment to review it. As you review and clear out your inbox, you can file notes, from your zendone inbox, into the appropriate evernote folders; and decide which notes need to be turned into tasks. Evernote entries show up in the zendone inbox, where you review them in order of arrival. No picking and choosing - textbook GTD stuff. If you already know that a note will require action, you type a hyphen in front of its subject. 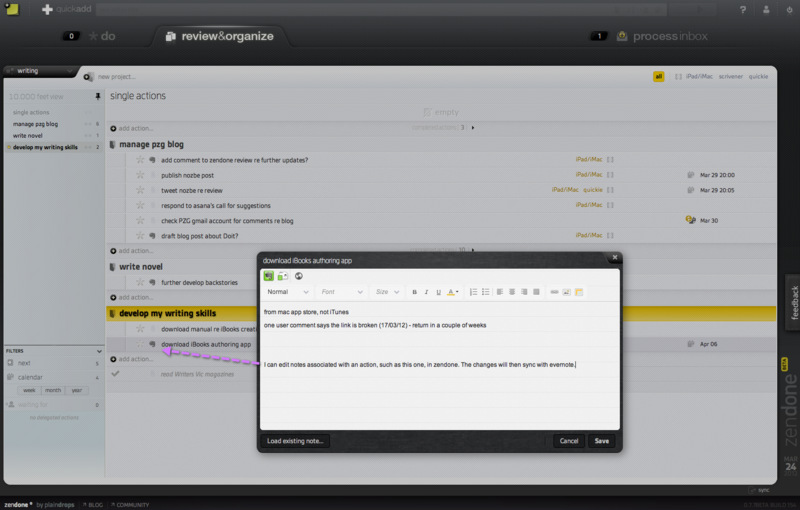 Zendone will then recognise the incoming evernote entry as a task. 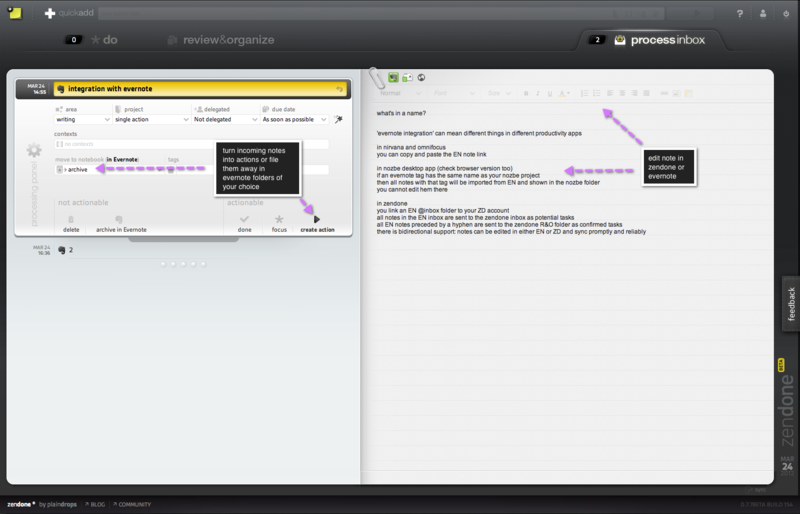 It will bypass the zendone inbox and send the task straight to the ‘review and organise’ section. Zendone offers two-way support: notes can be edited in either zendone or evernote and they are synched across the two apps quickly and reliably. The evernote integration is so well executed that the app is a joy to use. These latest improvements are further proof of the innovative thinking of the team at zendone. No wonder there is so much buzz about what still is a beta version. Interesting days ahead. This entry was posted in productivity and tagged evernote, nirvana, nozbe, omnifocus, productivity, zendone by Gilbert Van Hoeydonck. Bookmark the permalink. So how do I get them to send an invite? I signed up months ago. Try sending them a tweet – I received an invite for the beta instantly. I had earlier also signed up on the zendone website by email, but to no avail. I think they are hoarding their email database until their capacity (staff, server?) increases. While I understand the zendone team is very small, as a beta user I have found them very helpful and responsive. So I hope you get an invite! I’ll give it a good workout this week. I’ve been using Gqueues for a long time but the disconnect between my GTD workflow and Evernote is growing more and more annoying. Nice post and a good synopsis of all those good task management programs with Evernote integration. I’m on a Zendone trip at the moment and really enjoying it. I can’t wait to see it grow even more. Thanks for the feedback, Naveta; I am glad you enjoy my blog. You are most welcome to follow my infrequent tweets @purplezengoat!